We’re officially 3 days into October and we’re still finding our groove after completing the Local Thirty challenge in September. I’m going to do a write up on the whole experience at some point this month but I definitely need a little time to absorb everything. What I will say, is that I can rest a little easier at night knowing that there are so many wonderful people doing great things in our community. In a time when the world feels like it’s falling apart this has been the most comforting part of the challenge. 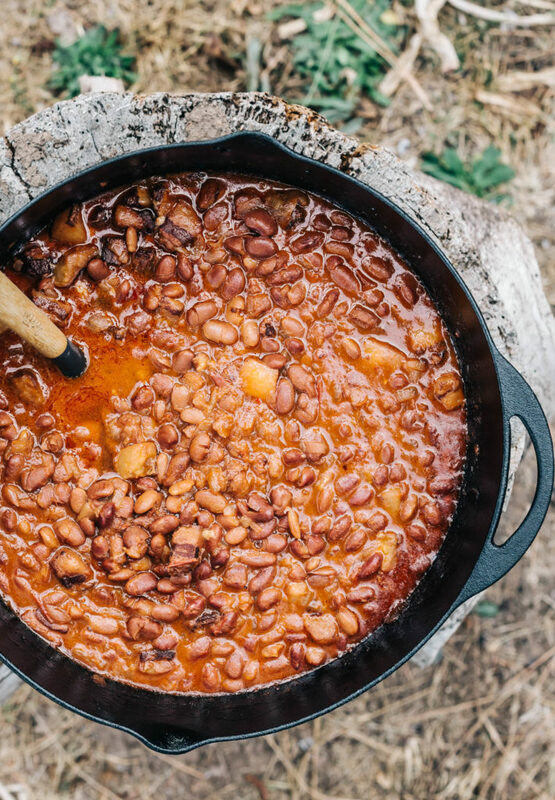 This recipe for Honey and Cider Baked Beans is a side dish that my brother and I made for Taylor on his birthday (which just so happened to land at the end of the Local Thirty challenge). We invited folks over to the house and slow roasted pork spare ribs and served them with this huge batch of baked beans. Everything we served was sourced within 200 miles of the farm (the pork is from our recently harvested pigs so that was awesome!) and the beans were the biggest hit of the evening (thank you Sun Gold Farm for the best pinto beans ever!!) I hope you all enjoy this hearty recipe as much as we do. I know baked beans take quite a bit of time, but it’s hands off time which makes them easy to prepare as long as you plan ahead. The result is worth a day of slow cooking and the smells coming out of your kitchen will knock your socks off. Drain the soaked beans and set aside. Heat a large dutch oven over medium high heat. Add the chopped pork belly and cook, stirring often until lightly browned (doesn't need to be completely cooked). Use a slotted spoon to remove the pork from the heat and discard all but 2 tablespoons of the fat. Add the onions and cook, stirring occasionally until starting to brown. Add the hard cider and bring to a low boil. Scrape up any brown bits at the bottom of the pan. Reduce the heat to low and add in the tomato paste, honey, mustard, salt, pepper, beans and reserved pork belly back to the pan. Add enough water to the pot to cover the beans. Cover the pot with a lid, place in the oven and bake for about 5 hours, checking the beans every couple of hours and adding more water as needed to keep them submerged. Cook until the beans are tender and the mixture is thick. Taste for seasonings and serve hot directly from the pot. 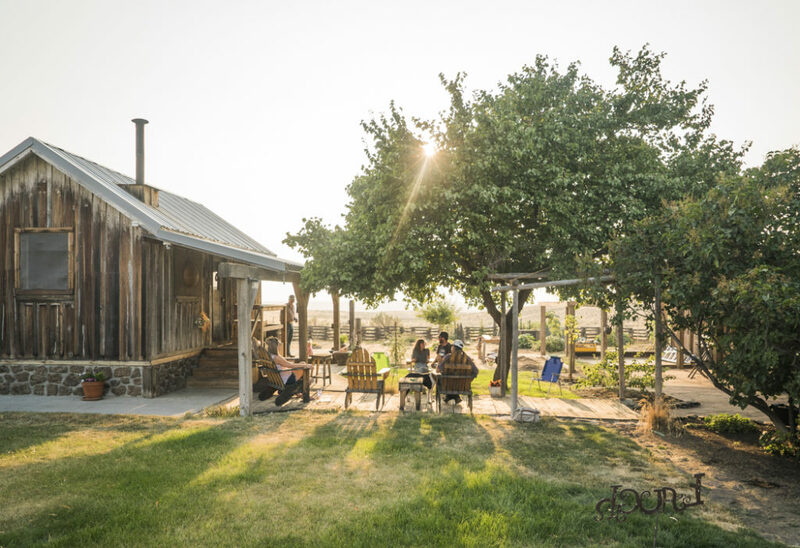 Sun Gold Farms really DOES have the very best Pinto beans – I bought them for the first time last year and couldn’t believe how delicious they were! The beans look truly amazing but what do you normally serve them with? Open to ideas! We served them with pork spare ribs. But any pork dish would be great. Or with steak. I hope that’s helpful! Andrea do you have great pork spare rib recipe? These beans sound absolutely wonderful. I’ve never heard of dry hard cider before, and I’m not sure where to find it. Is that something my local liquor store would have? you can find dry hard cider in the beer section of your grocery store. I hope you enjoy the recipe! Very creative twist using cider for baked beans. I can just about smell these! Is this your home? This looks magical! We get the best pork from my best friends father every fall. I had a roast left from last year so I was getting ready to make pulled pork when this recipe appeared! We LOVED it! And so easy to make. Thank you for sharing and for your lovely book! Delicious! I made these last night and saved them with some Wellshire applewood smoked ham. Easy to make. It just requires being around the house to check on them!